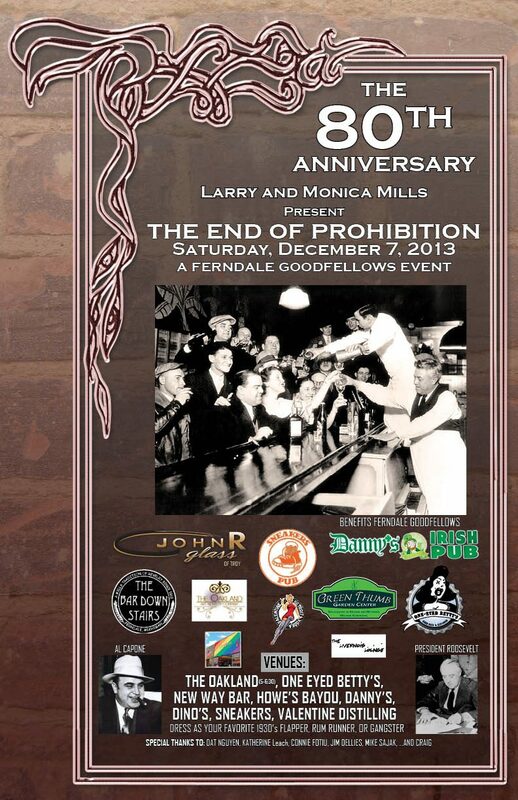 Every year bars and restaurants in Downtown Ferndale join a group of dedicated residents in celebrating the anniversary of the end of prohibition. With 1930s style gangsters and flapper girls hanging out at favorite hotspots, the group collects donations for Ferndale Goodfellows to help them with their holiday food and gift giving to needy families. The event takes place Dec. 7. Participating venues include: Danny’s, New Way Bar, The Oakland, One Eyed Betty’s, Dino’s Lounge, Howe’s Bayou, Sneakers and Valentine Distilling Co.
Last year, with sponsorship money and a Community Foundation grant included, the event raised $4,300. In the past six years of the event, it has raised over $19,000 to help families in need.